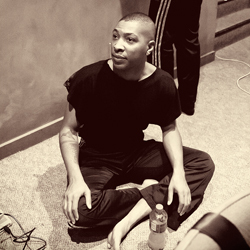 Kyle Abraham, the 2012 Jacob’s Pillow Dance Award recipient, began his training at the Civic Light Opera Academy and the Creative and Performing Arts High School in Pittsburgh, Pennsylvania. He continued his dance studies in New York, receiving a BFA from SUNY Purchase and an MFA from NYU Tisch School of the Arts. Over the past few years, Abraham has received tremendous accolades and awards for his dancing and choreography including a 2010 Bessie Award for Outstanding Performance in Dance for his work in The Radio Show, a 2010 Princess Grace Award for Choreography, a BUILD grant and an individual artist fellowship from the New York Foundation for the Arts, a Jerome Foundation Travel and Study Grant, and selected in 2009 as one of Dance Magazine’s 25 To Watch. Kyle worked on Radio Show during a 2009 residency at Kelly Strayhorn Theater, and it premiered at KST in January 2010. In November 2011 Kyle complete work on LIVE The Realest MC! during a one-week residency leading up to the premier at KST on November 18–19, 2011.